The fourth and final slide club of the year was held on Wednesday 3rd August. Debra presented a case of periarticular myxosarcoma in a Flat coat Retriever, a rabbit with inflammation of the lacrimal gland and a Boxer with a splenic liposarcoma. This last mass initiated a discussion of myelolipmoma and the origin of fat cells in these lesions. Marta presented a Boxer with protozoa identified on lung aspiration and BAL; differentials being Sarcocystis, Toxoplasma and Neospora the latter identified as the culprit by pcr on BAL fluid. Marta presented another lung FNA which identified SCC in a Cocker Spaniel. 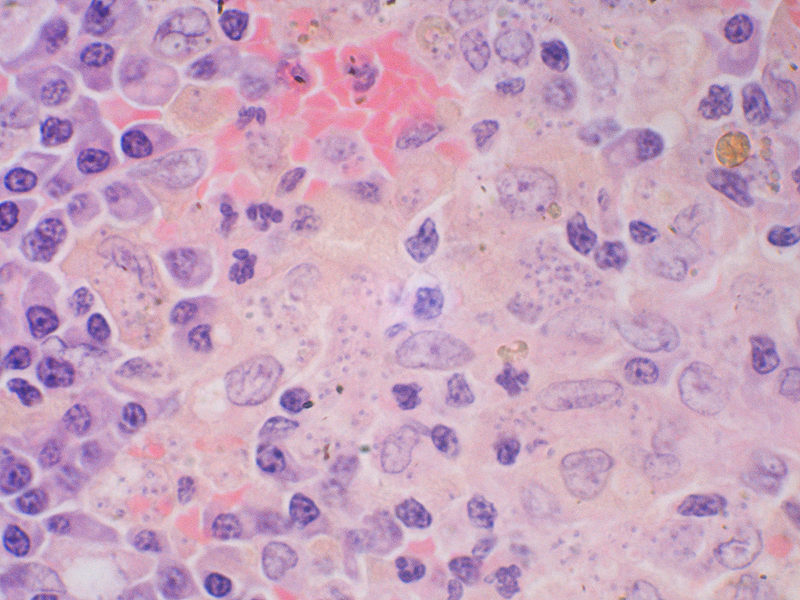 Marta then presented a submandiublar lymph node aspirate from a cat with large round cells showing erythrophagia, leukophagia and some atypia. The discussion centred on whether these were reactive or neoplastic. Kathleen presented follow up for the young greyhound presented last meeting. 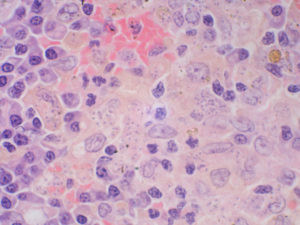 The histology and immunohistochemistry indicated a very poorly differentiated sarcoma. Lucy presented post mortem samples from a young Sharpei that died acutely in renal failure. The kidneys showed a membranoproliferative glomerulonephritis and amyloid staining was negative. Granuloumatous splenitis and hepatitis with numerous Leishmanial protozoa were also present and considered the likely predisposing cause for the membranous GN. Lucy also presented a case of alopecia areata in a dog, with concurrent pyoderma. The differential of pemphigus foliaceous and that more than one autoimmune disease may present with alopecia areata were discussed. Thomas EA, Kadyan RS. Alopoecia areata and autoimmunity: A clinical study. Indian Journal of Dermatology. 2008;53(2):70-74. doi:10.4103/0019-5154.41650.